This is my second post today. Click HERE for the Custom Button post. Hello my friends! 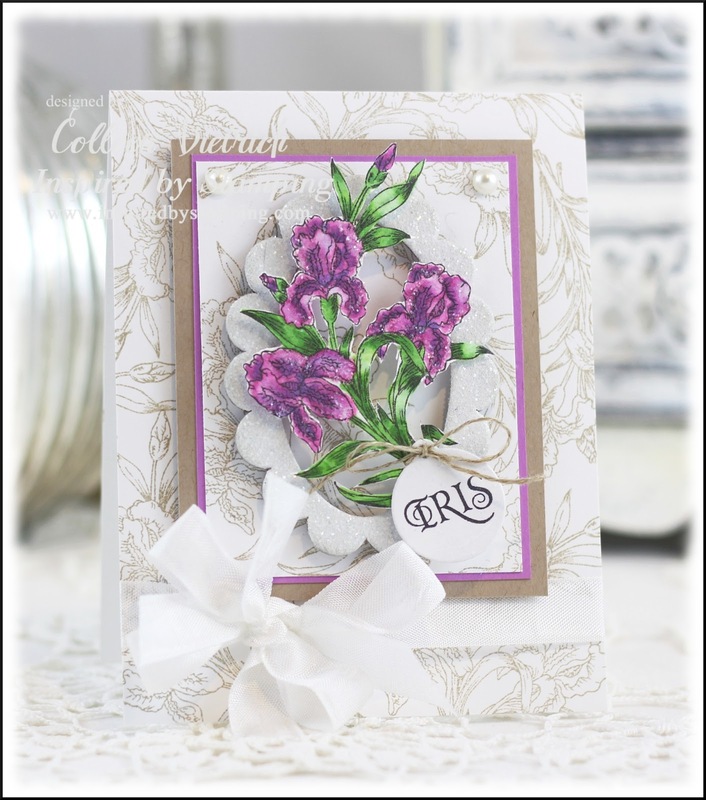 I'm excited to share my first project of our March 2013 release at Inspired By Stamping. Inspired By Stamping, owned by Joanna Munster, features quality photopolymer stamps with coordinating dies, Silhouette cut files and beautiful embellishments. This month we are releasing 6 new stamp sets! Every month we release new stamps and other fabulous products for all of your crafty needs. All of our sets come with a free cut file whether you purchase the set or not, the files are free for you to use. Some of our stamp sets will also have coordinating die-cuts so you get the best of both worlds! During the countdown to the release, please join us for contests, prizes and more at Joanna's blog. One of the new sets in this release is Beautiful Iris. Sigh. I absolutely love it! Irises are one of my favorite flowers. When my grandmother was still alive and I became a new homeowner, my grandmother had me dig up some of her irises to transplant in my own garden. Every spring, I have a lovely reminder of her to gaze upon. I used the iris stamp to create my own patterned paper directly on the card base using a kraft-colored ink. I mounted them on a glittered chipboard frame, too. This is one of the 5 sentiments in the set. Love how it fit perfectly on my round tag. Absolutely stunning card Colleen! Love the colours you have used and the beautiful BG created. Wowwwwwwwwww! this is just gorgeous!! I loveeeeeeeeee those colors!! what a gorgeous card! I love irises and this stamp is just perfect for Easter! Beautiful card!! Love what you did with the set! Great cutting out of the colored iris!! What an absolutely Gorgeous Card Colleen ...i just love the way you have colored and fussy cut the flower its so perfect :)I love all the details of your card ..Just fabulous!! So beautiful! Love the background and your coloring of the irises is absolutely stunning. Gorgeous colors and fabulous card! I have a host of irises in my front garden bed and they are lovely. Great colouring of the image and love the added touch of glitter. Colleen, love how you made your own beautiful paper by stamping the iris in the background and then really giving it life as your main image. Your coloring is perfect and love the bling too. Another beauty!!! I LOVE this card!! Gorgeous card Colleen! Love the way they're spilling out of your sparkly frame! OMG... I love this!!! I love how you stamped the Iris in a brown and used it as background and matting paper. 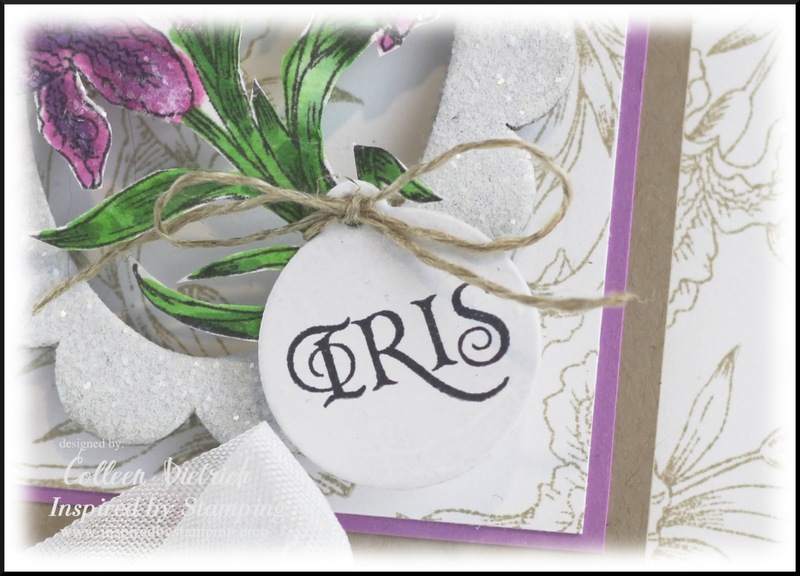 Love the glitter on both the scalloped oval and your colored Iris. This is card is stunning. GORGEOUS card! The background is amazing and LOVE the iris! WOw, the shimmery look and the fun glittery chipboard piece it sits on..so pretty! Love the details in your card! Wonderful work! Beautiful work! I love your coloring and shading on the iris'!!! 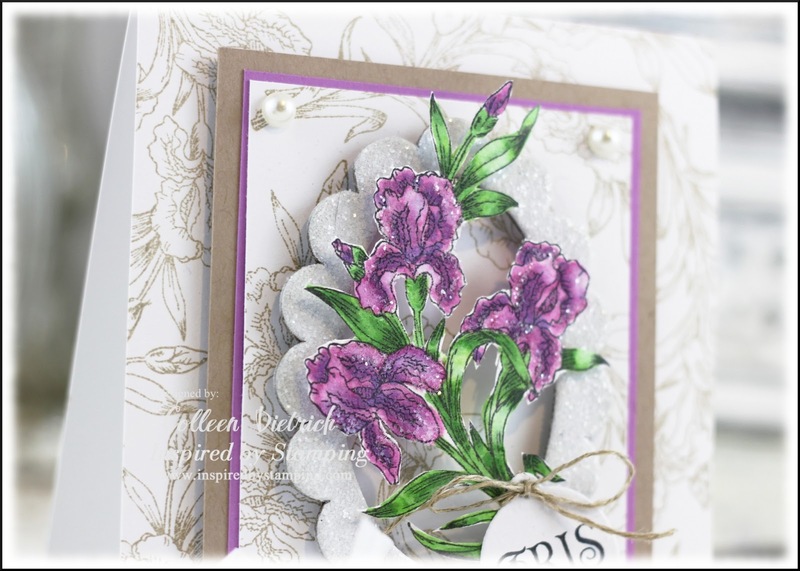 LOVE how you made the stamped background and your glittery iris are GORGEOUS! The one I've been waiting for...I love irises. This is beautiful and I love your glittered frame. I want this iris!!! Love your ribbon, too. Oh, my word! Drop dead gorgeous! What more can I say? I swoon!